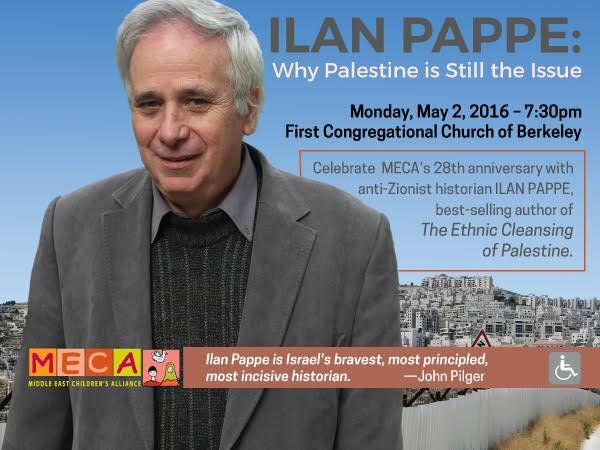 Professor Ilan Pappé was the keynote speaker at the anniversary celebration of the Middle East Children’s Alliance (MECA), a nonprofit humanitarian aid organization based in Berkeley. Since 1988 MECA has provided more that $21 million in food, medicine, medical supplies, and clothes, as well as books, toys, and school supplies to children and families in Palestine, Iraq, and Lebanon. Complete audio recording and annotated transcript is freely available. Summary excerpts follow. We don’t need to be reminded that Palestine is still the issue. But I think you understand that the context of this talk is different. A lot of people would tell us, that given what’s going on in Syria, in Iraq, given the magnitude of the refugee issue in Europe, the economic problems in the United States, Palestine has been marginalized as an issue of global attention and you cannot galvanize anymore people to see Palestine as a central issue of humanity and inhumanity.It is important to remind ourselves why Palestine, in this respect, despite all the horrific things that are happening in Syria and Iraq, in Libya and Yemen, and despite the problems facing refugees in Europe and here as well, despite all of these distractions, if you want, it is important to remind ourself that Palestine is the issue because much of what we see in the Middle East and outside the Middle East, is connected to what happened in the past in Palestine and what happens today in Palestine. Settler Colonialism as you may know, is the movement of desparate Europeans outside of Europe because they were persecuted there; because they felt that Europe was unsafe. And they went to other countries, to other continents. And when they arrived in those new places, they found an indigenous native population. Because they were persecuted, because they were looking for a one-way ticket out of Europe, they felt that they don’t only want to make the new country a home, but also to make it a homeland. We have to remind ourself, and remain hopeful, that Palestine is still the issue because people were not genocided there. Because there in Palestine the logic of elimination that informed settler colonialism in this country was terrible enough, but was not genocide…. This irrational, this cruel logic, that is at the heart of the connection between Zionism and anti-semitism still fuels most of the support Israel gets in this country, and still is the main ammunition pro-Israeli groups and individuals use in this country to silence any criticism on the Jewish state and its criminal policies…. the second reason that Palestine is still the issue [is] because the Jewish problem of Europe, the Jewish problem of the West, is a universal problem. Because it is not only the problem of the Jews. The genocide of the Jews in the Second World War showed the cruelty of modernity, of European Enlightenment, of the aspirations of Europeans to be culturally, morally, and politically superior to any other civilization. We need the closure to that terrible chapter in the history of humanity. Allowing Jews to colonize Palestine and dispossess the Palestinians is not the answer to this problem…. Palestine is still the issue because it is connected, also, to Islamophobia. It has a long history of connection to the fear of Muslims just because they are Muslims. The Balfour Declaration, in which Britain gave something that didn’t belong to it to a movement it didn’t belong to … the two motives for the British Empire, to take part of the Middle East, part of the Arab world, part of the Muslim world, and to grant it to a new ideological movement and promise that the empire would do its utmost to create a homeland there, the two major motives were, surprisingly, anti-semitism and Islamophobia. There was a fear of Islam, there was a fear of Muslims, very much at the heart of the British policy makers who were about to take the Middle East as a new possession in their empire that already was very big and they much preferred to have non-muslim enclaves and kingdoms if they could in their new domains, in their new possessions…. Palestinians were the first victims of Islamophobia in modern times. They are also the last victims of Islamophobia in our times. It is the fear of Islam, it is the hatred of Islam, it is the animosity to Muslims just because they are Muslims that helped Israel to stop almost a natural process in the United States at the very end of the last century in which Americans, because of the easy access to information, to knowledge, began to understand what was going on the ground in Palestine. It was the major tool by which Israel, after 2001, associated terrorism with Palestinians in a way that stifled any proper discussion about Israel, Zionism, and Palestine in this country. And we are witnessing it again and again, the attempt to associate violence that is carried out by desparate people in Europe and their supporters with justification for the state terror that Israel exercises against the Palestinians. Palestine is still the issue because it is also an issue of social justice…. Social justice, more than anything else, is a struggle against double talk, against hypocrisy, against exceptionalism, against deception. And no other case of violation of human rights and civil rights can compare with the case of Palestine when it comes to exceptionalism, deception, and double talk. This is something we are all familiar with and we know. It is not only the cruelty of the occupier, the inhumanity of the colonizer. It is the pretense of those who support these actions that what we see is not the crime but rather “the war of defense,” “a democratic action,” “a justified moral policy.” We are all familiar both with the double talk, with the language, with the fury, the pretentious fury, the righteous fury that goes along and accompanies the atrocities on the ground. It is this hypocrisy, more than anything else, that symbolizes for workers around the world the way that they are being treated by their employers, by the multi-national corporation, and therefore you can see how many people today understand that the fate of the native, who was a victim in a settler colonialist project, is the fate of the worker today and the neoliberal system that we are living in…. I think many people, especially in Europe, but I have seen it here in 2008 as well, understand the connection between Flint, Ferguson, Palestine, India, Pakistan, Africa—this is part … You are not only struggling against the criminal policy, you are struggling against the narrative that claims that this is not a crime—that this is for the benefit of the people—that the whole discourse that pretends to improve people’s life but actually destroys them is exemplified in Palestine on a daily, if not an hourly, basis. The Palestinians will have to redefine their project of liberation and adapt it to 2016. It is very difficult given the fragmentation which is the greatest Zionist success. The Palestinians were fragmented to five different groups. Naturally each one of these groups developed its own agenda. But we need a united Palestinian front, we need united Palestinian Representative bodies. None of the bodies that exist today represent faithfully, the needs and aspirations of the Palestinian. They usually represent a slice of the Palestinian issue and that kind of slice always serves well the Israelis and those who want to harm the Palestinian people. The second thing that we have to take into account, 2016 should be the time where we all would be invited to the funeral of the two-state solution. The body is already in the morgue. Every now and then there is an American negotiator who takes the body out of the morgue, puts some life into it, like Jesus, and makes us feel as if it’s still alive then tells us it’s just around the corner. But apparently that corner is not on Earth. It’s somewhere on Mars…. We need you on our side. We need every good person, inside and outside, a Palestinian and a non Palestinian, to join forces with us and find out how do we respect the human rights, the civil rights, of both the native population of Palestine and the settler community that now is in its third generation? How do we help them to build a political system that rectifies the evils of the past and promises good future life for everyone who is there and everyone who was expelled from there? So the whole Middle East is watching and says, the problem is not inhumanity, the problem is not eliminating human beings or de-humanizing them. That is not the problem. The problem is whether you are a member of the exceptional club who is allowed to do it. And Israel is the sole member of this club in the Middle East…. But you can never have a genuine conversation about human rights and civil rights as long as the exceptionalism of Israel continues. So if you want to talk to Syrians about human rights and civil rights, start in Palestine. Don’t start in Damascus. If you want to talk about human rights in the Yemen, in Libya, start in Palestine. People would then believe that you really care about human rights, about civil rights. And Palestine could be the place where it’s not only still the issue but it also can push the issue of human rights and civil rights. And then maybe we will understand why it used to be called the Holy Land. Because now it is anything—it is the Hollow Land and not the Holy Land. And we have to bring it back to its historical, ethical, and moral place in history by having this kind of conversation. So I will end by saying, don’t let anyone tell you that the Palestine issue is less important than any other issue. Don’t give up on Palestine and the Palestinians. And be brave enough to put aside slogans, formulas, solutions which are irrelevant, that are negative, that are destructive, and join the new energy that we are feeling coming out from many parts of Palestine and Palestinian life that wishes to create normal life, democratic life, human life for anyone who lives between the river Jordan and the Mediterranean and anyone who was expelled from that homeland and wishes to come back.